At this rate, any of these people might be on the Knicks squad in coming weeks. Following a 15-game losing streak (by an average margin of 15 points per game), New York Knicks President Phil Jackson has decided to replace the virtually the entire Knicks roster with players from the Westchester Knicks, the team’s development league affiliate. Jackson and NY Knicks head coach Derek Fisher found inspiration for this move when Langston Galloway, their most recent D-League call-up, showed heart, skill, and understanding of the offense during his first 3 NBA outings. Knicks front office consensus is that if Galloway represents the progress being made in Westchester, then the entire D-League roster deserves a chance at the big show. “At this point, how much worse could it get? We’re abysmal,” said Jackson when explaining the decision to the press Sunday afternoon. The move appears to be timed perfectly, as the Knicks’ next game will be against the Milwaukee Bucks this Thursday in London, England. 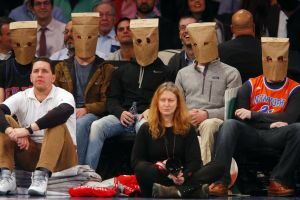 The hope from Knicks owner James Dolan is that the new-look Knicks will have a chance to work out their jitters for a crowd that couldn’t care less before debuting for a rabid fan base that remains steadfast despite the damage it does to their sanity.